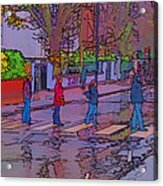 Abbey Road Crossing by Chris Thaxter - 8.000" x 5.000"
Abbey Road Crossing art print by Chris Thaxter. Our prints are produced on acid-free papers using archival inks to guarantee that they last a lifetime without fading or loss of color. All art prints include a 1" white border around the image to allow for future framing and matting, if desired. 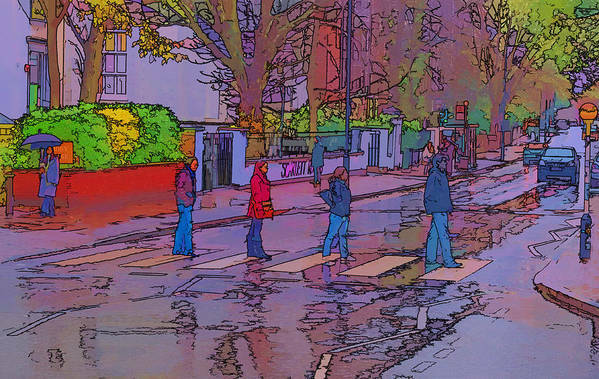 There are no comments for Abbey Road Crossing. Click here to post the first comment. 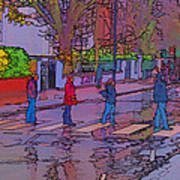 My own image of people replicating the iconic group on the zebra crossing in Abbey Road, taken from the public highway.. Image processed in Photoshop and cartoonised. 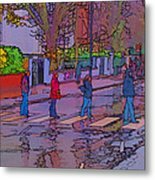 Abbey Road is a thoroughfare located in the borough of Camden and the City of Westminster in London, running roughly northwest to southeast through St. John's Wood, near Lord's Cricket Ground. It is part of the B507. 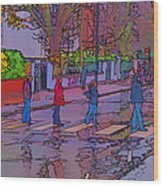 This road is best known for the Abbey Road Studios and the 1969 album.. As a result of its association with this group, since 1970 this section of Abbey Road has been featured on the London tourism circuit. In December 2010 the crossing was given Grade II Listed Building status by English Heritage. The crossing featured on the cover, has become popular photo-opportunity area, despite the road still being a busy thoroughfare for traffic.